Antbear also boasts a unique accommodation experience in our luxury "Cave". The luxury Cave includes a jacuzzi spa bath, king-sized double bed and fireplace in the bedroom. The front of the Cave is glassed in and opens on to a wooden deck with hammock chairs and a spectacular view. This accommodation is ideal for those intimate romantic getaways, honeymoons and special anniversaries. The meals prepared at the Antbear are distinctive and are themselves as much a reason to stop by as are the many attractions of our area. We try to produce as much of our own ingredients as possible. With an organic vegetable garden, free range chickens and our own cows, we are even able to offer our guests homemade cheese. Bread, jam, vegetables, eggs and milk all originate from our little farm.Antbear is situated in the centre of the Drakensberg, overlooking the Bushmans River Valley with a view of Giants Castle, right over to Royal Natal National Park. There are many spectacular sites to visit in this area, from day trips into the mountains, exploring the various Rock Art (Bushman cave drawings that are 300 to 2 000 years old) to Horse trails and White Water rafting. The Karkloof Canopy Tour offers a spectacular cable slide with unforgettable rides and awesome views of the forest canopy - something for the more adventurous. If you have a serious head for heights, then the hike to the top of Mont-aux-Sourses to the top of the Tugela falls (950m - the 2nd highest waterfall in the world) is well worth it. Quad bikes and trails, Hot-air balloon flights and Battlefield tours can also be arranged. 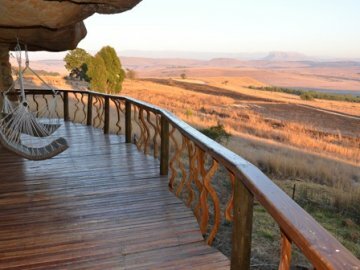 We are part of the Midlands Meander, should you wish to explore our craft route, as well as take in some Game viewing at the Weenen Game Reserve.